The California Spangled is a breed of domestic cat that was bred to resemble spotted wild cats, like the ocelot and leopard. They were originally bred in the 1980s and were only ever a rare breed, with only 58 ever being registered. They were usually expensive, priced between US$800 and $2,500. 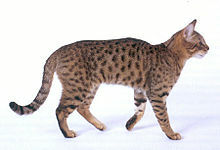 The popularity of two other spotted cats breeds, the Ocicat and the Bengal, overshadowed their development. Inspired by the poaching death of a leopard, the anthropologist Louis Leakey motivated Paul Arnold Casey, Jr. of California to breed a domestic cat resembling a small leopard in order to emphasize how important it was to preserve the leopard. Originally bred by Paul Arnold Casey, Jr., a Hollywood scriptwriter, playwright, and author, after his return from Tanzania while working with Louis Leakey in the 1970s. Casey's novel, "Open The Coffin" chronicles his journey in Africa and subsequent breeding that led to the California Spangle. This animal was ideally bred to resemble a leopard, thus giving the impression of a "House-Leopard". One of many motivations for this breed was that people would not want to wear the same type of fur that resembled their pet. The Spangle was introduced to the general public on the cover of the iconic Neiman Marcus Christmas catalog in 1986. California Spangled Cats are said to be affectionate, social, curious, and extremely devoted to their owners. They are big on eye contact and being in on the action; they love to perch on places that are at shoulder or eye level so that they can see exactly what is going on. They are known for their well-honed intelligence, athletic abilities, high energy level, and accidental acrobatics. California Spangled Cats love to pounce and have very sharp hunting skills, they also enjoy games that involve a large participation part by their owner. ^ "Error 404" (PDF). www.tica.org. ^ Syufy, Franny. "History of the California Spangle." Ask.com. 1 Windows Vista. 25 Feb. 2008 <http://cats.about.com/od/breedprofiles/p/caspangle.htm>. ^ Ask.com. Arm and Hammer cat litter. 12 Mar. 2008 <http://cats.about.com/od/californiaspangledcat/California_Spangled_Cat.htm>. ^ Syufy, Franny. "California Spangle." Ask.Com. 1 Life's Abundance Pet Foods. 19 Feb. 2008 <http://cats.about.com/od/breedprofiles/p/caspangle.htm>. ^ Appearance." All About Cats. 1 iLoveindia. 3 Mar. 2008 <http://pets.iloveindia.com/cats/cat-breed/california-spangled-cat.html>. ^ Tyson. Pretty Kitty. Flint River Ranch Premium Pet Food. 11 Mar. 2008 <https://web.archive.org/web/20091028075738/http://www.geocities.com/pndtpa/breeds/CaliforniaSpangledCat.htm%3E. ^ Helgren, Anne J. "Personality." Petplace.com. 1 Promeris. 27 Feb. 2008 <http://www.petplace.com/cats/choosing-a-california-spangled-cat/page1.aspx>. Look up california spangled in Wiktionary, the free dictionary. Wikimedia Commons has media related to California Spangled Cat. This page was last edited on 14 August 2018, at 01:11 (UTC).